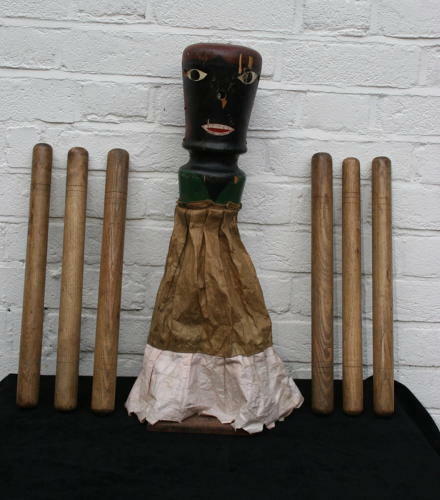 A Nice Folk art Aunt Sally game , complete with 6 throwing batons, all in its original wooden storage Box, English c.1900. This Old English Pub /garden / summer fete game originates from Oxfordshire and the aunt Sally was loaded with clay pipes and one would take turns in throwing the batons to knock/smash them out. This is a nice painted Folky example where she has been given a long skirt. Just add clay pipes for all the fun of the fair.